The first tree I noticed when I came to Aichien a year ago was this huge monster Black Pine! As I wondered around the yard I kept coming back to this one and snapping pictures of it with the camera. The reason why this Black Pine intrigued me so much (yeah, who wouldn’t be) was that it wasn’t a finished tree. This tree was a perfect example of a tree in development. As I looked over the tree, I thought to myself, “how great is it if I can play a small part in the development of this tree.” Well, a few weeks ago, I got to do just that. As you can see from the photo, the branches are growing out and sections of the canopy is still empty in some places. The trunk was collected decades ago and all of the branches were grafted. From the looks of the branches, the grafting was done about 8-10 years ago. In this post, I’m going to be sharing some photos of this tree being repotted, discussing the soil mix we use and the importance of understanding how soils works. 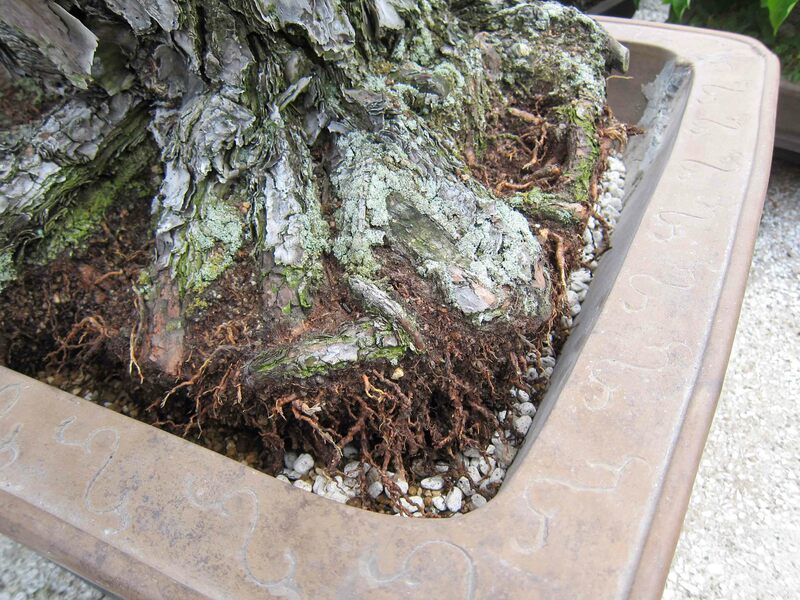 Soil mixes can be a hot discussion/argument among many Bonsai enthusiast. Different people use different mixes and material for various reasons and it seems that some will even fight to the death defending it. In this post, my intention is to only talk about the soils we use at Aichien and understanding why we use them. Overall, I’ve come to realize that the soil components used doesn’t really matter and that understanding how the components retain water and its effects on the tree is more important. Depending on the mix you are using, think about how they affect your trees and ask yourself, “is there something I need to change or adjust to better develop my Bonsai?” There is no universal soil receipt that will work for every tree at every developmental stage in every environment and everyone. 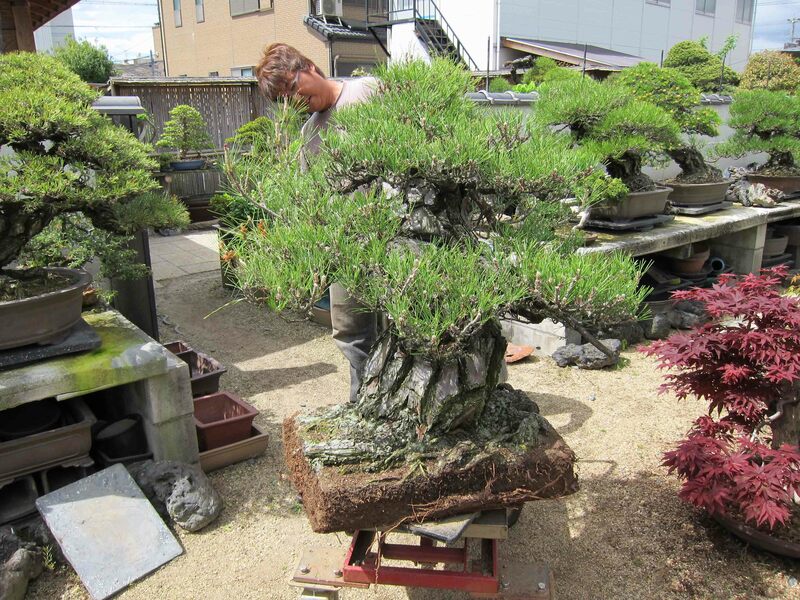 Since there are so many variables in Bonsai including the artist themselves, there would never be just one way to do anything. So instead of trying to defend the soil we use, I thinks a better approach would be to understand how much water a soil mix holds and how that affects the tree. This way, no matter what components we use in our mix, it’s focuses towards the tree and it’s water needs. Then we can move on to better things like creating great Bonsai! There’s going to be lots to talk about so lets get started! This Black Pine hasn’t been repotted for over 5 years. It just happens that I was lucky enough to be here when it was time. 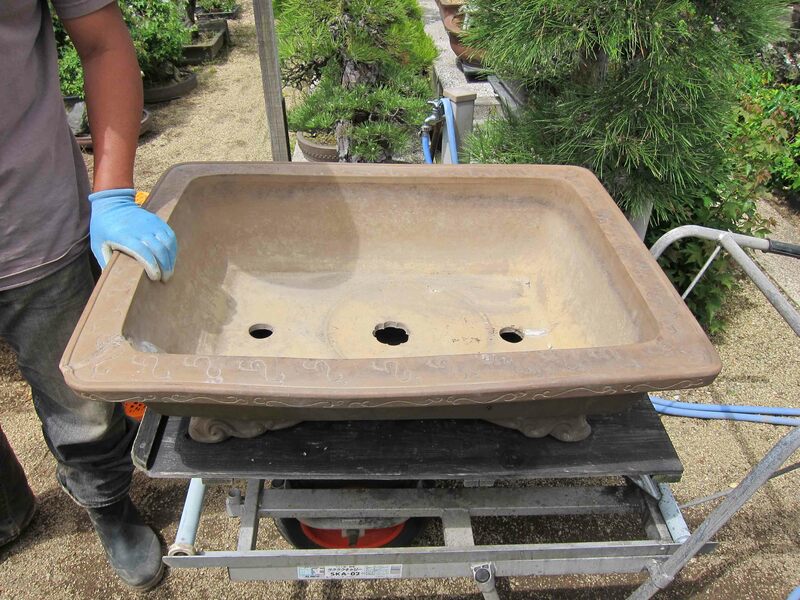 Mr. Tanaka said that if we waited one more year, the pot might not stay in one piece! I’m not sure if this tree is the oldest in the yard, but it’s definitely has the biggest trunk in the yard. Take a look at what we did. Since this tree was so big, we decided to go to it instead of bringing it to us. We ended up repotting the tree right where it stays. 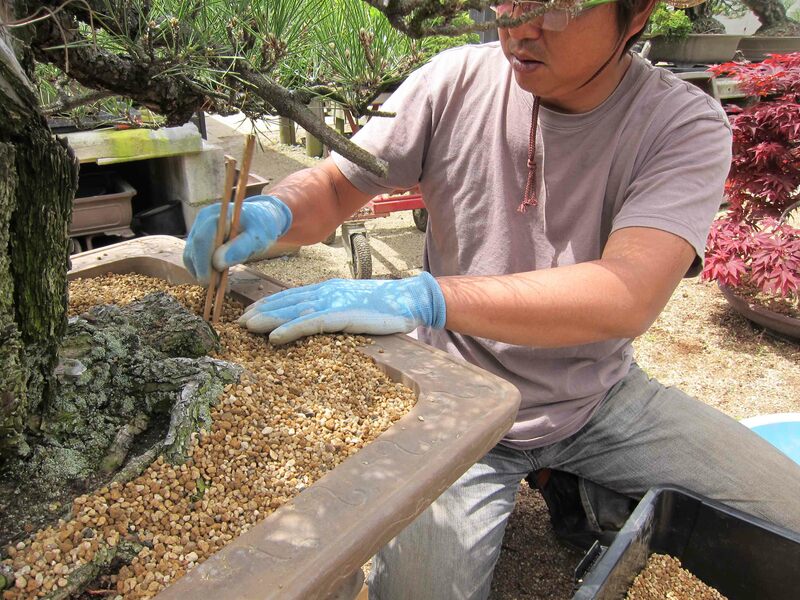 Here, Mr. Tanaka is using a root hook to help separate the root ball from the edge of the pot. He also used a root saw as well. I joined in and worked on separating the rootball from the pot. In this photo you can see a large channel that was dug out. We did this to all four sides of the pot. The soil was pretty hard and there were some areas that had large roots that we had to deal with. In many ways this was the most difficult part of the repot. If the pot had really good patina on it, we would have to be very careful in not damaging the patina when creating this channel. This tree wasn’t tied to the pot so it saved us from having to get underneath to cut the wires. Since the tree is so heavy, it’s not like Mr. Tanaka and I could just lift the tree out. What we did was this. I found a safe place to put one hand on the trunk of the tree and the other hand on the lip of the pot. I slowly separated the root ball from the pot to the point where Mr. Tanaka could shove a wood block in-between. We then did the same on the opposite side and the root ball was now above the pot. This made it a lot easier for both of us to pick up the root ball without taking the pot with it. Here’s the tree on the cart. Pretty big tree huh? The first thing we did was work the bottom side of the rootball. This picture is pretty cool because I was actually holding the tree with my left hand and holding the camera with my right hand. (I would have to thank Sam and KJ Edge for sending me a portable camera last Christmas. If I had to use my large camera, I probably would have skipped taking photos of this tree and the work.) After Mr. Tanaka finished raking and cutting the bottom roots, we set the tree back down and he started working on the sides of the rootball. At this point, he told me to go mix some soil for the tree. Understanding the individual soil component is all about understanding how much water it holds. How much water a soil mix holds will affect how the tree grows. Types of soil and sizes dictates how much water they hold. The soil mix then in turns, affects how we adjust our watering schedule. 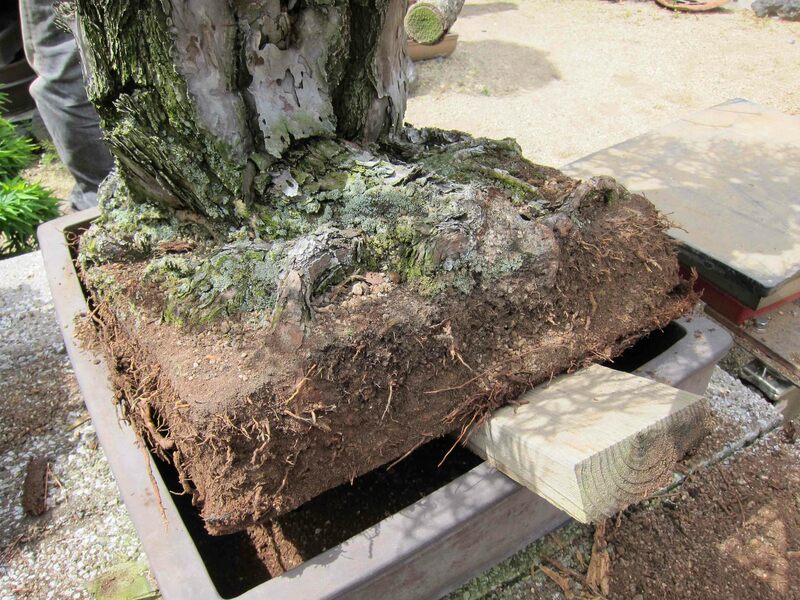 Forget your preconceptions of what bonsai soil should be made of and think more about how much water a tree wants, water retention of the soil and the effects it causes. In this case, we’re working on a Black Pine. Black Pines grow best in drier conditions and though it can take a good amount of water at one time, it needs to dry out for the roots to grow well. 1. Trees will grow slower if the soil is wet for a long time (wet mix). 2. Trees will grow faster if the soil is we for a short time (dry mix). Of course there are exceptions to everything but for the most part, these statements are true. Akadama is a clay that has been fired. Depending on the temperature at which it was fired, the hardness of the clay will change. Depending on the hardness of the akadama, it will break down at different rates. Soft akadama breaks down faster and hard akadama breaks down slower. This material is what holds most of the water in the mix. 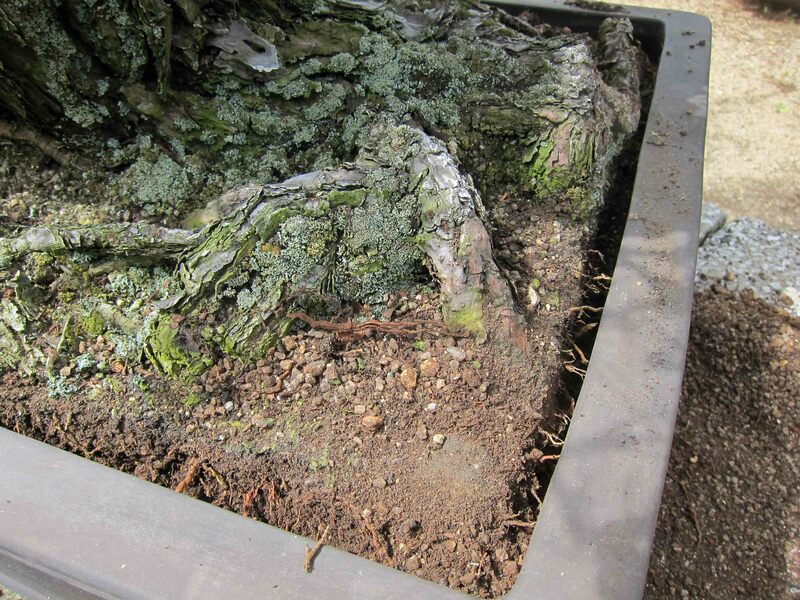 The reason why akadama is a good soil medium for bonsai is it evolves with the root system by breaking down. 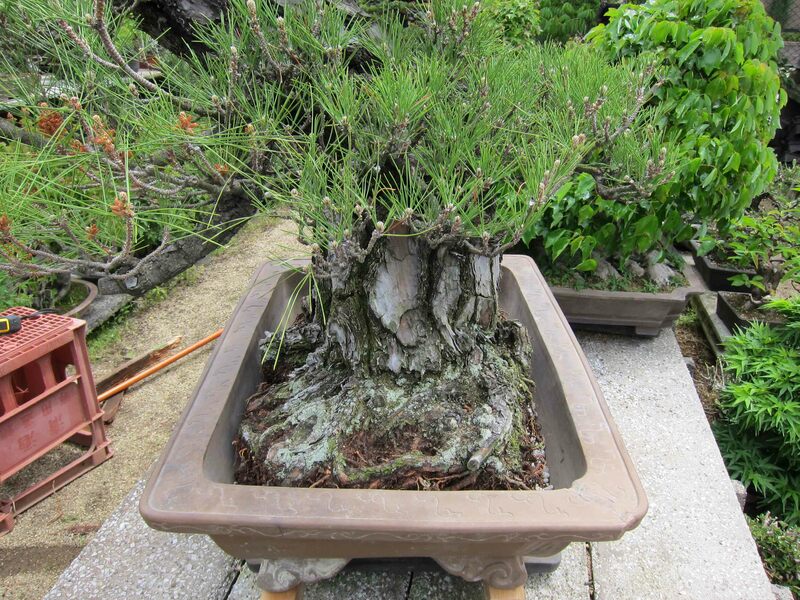 When a tree is first repotted, there are not many roots so fresh new akadama holds less water. As the tree grows more roots and demands more water, the akadama will break down and start to retain more water. There is a point though where akadama will breakdown so much that it will bind together and form a water repellant block that stays very dry. Depending on the tree variety, this may be a good or bad thing. Akadama in Japan is very cheap. It available at the local garden center and is about 500yen per bag ($6.00US). Shipping this stuff around the world makes this material much more expensive and have turned away bonsai enthusiast from using it. When the price of akadama becomes 30 dollars a bag, I understand. Coarse river sand is just that, large sand particles. 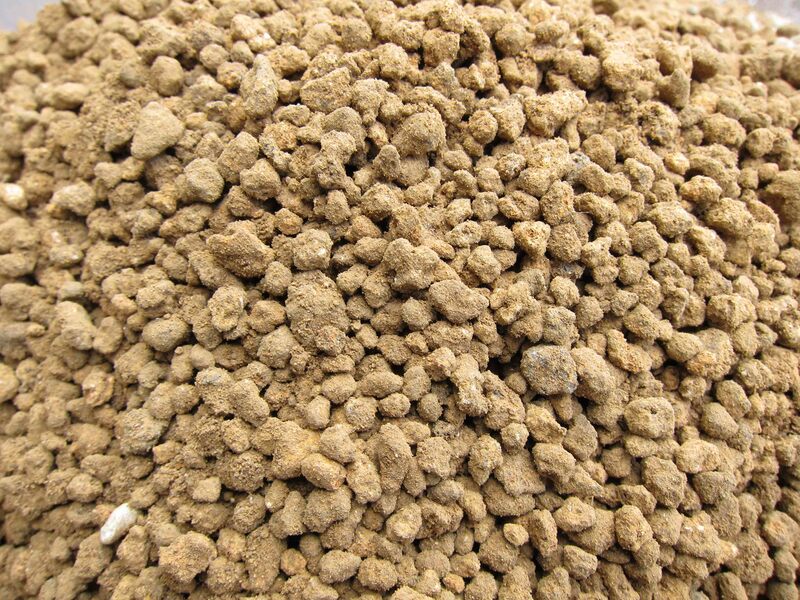 This medium is used to help in the drainage of the soil. Other then surface tension of the small granules, this medium doesn’t hold water at all. It’s not important though that it’s coarse river sand. The important part is that it doesn’t hold a lot of water. Are there other materials out there that will do the same? Of course! Hyuga is a type of volcanic rock. It doesn’t normally break down though if compressed hard enough will crumble (everything breaks down with enough pressure). The average piece of pumice will not normally break down. Hyuga is light and holds some water though is considered a fairly dry component. 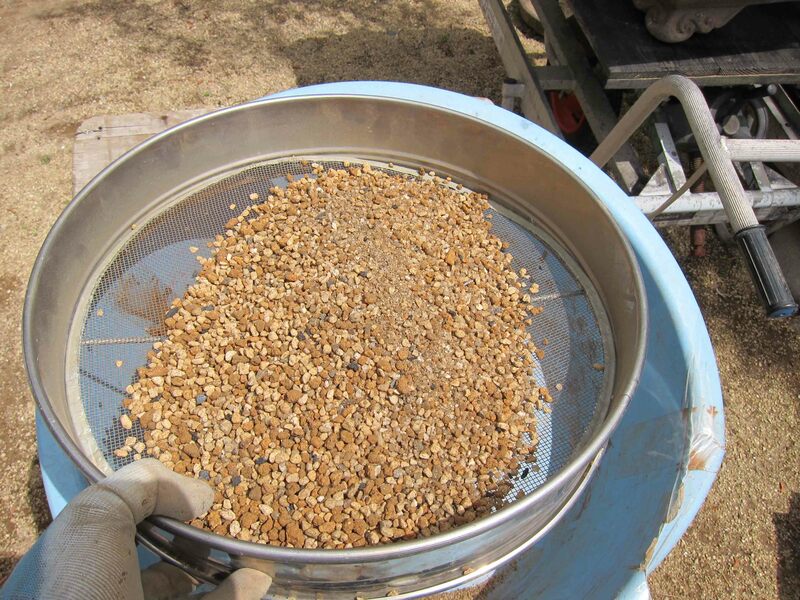 It’s mainly used to dry up a soil mix just like coarse river sand. In Japan, a bag of hyuga normally has a small amount of granite mixed in as well, which are the darker pieces in the photo above. The last component that we add to the mix is crushed charcoal. It’s less then 5 percent of the overall mix. 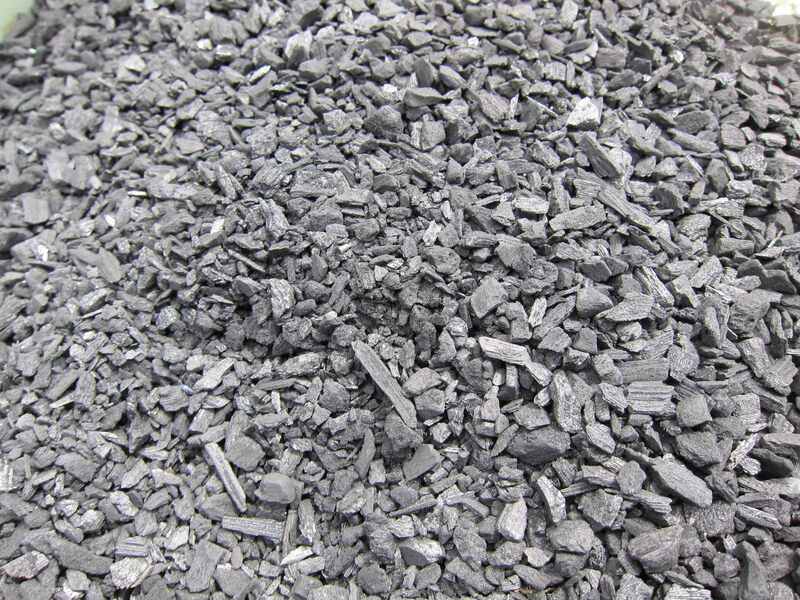 Charcoal is used as an absorbent of any toxicity that is found in the environment. Pollution in the air and water could potentially have an ill effect on our Bonsai so a little bit of charcoal can help limit their amounts in the soil. Unlike full grown trees in the ground, our Bonsai are limited in space to grow so keeping that environment clean is a plus! Here is all the components together. I used the shovel and slowly mixed everything together. After I mixed the components, I took out the sifter and sifted out the dust and small particles. This is how much dust and small particulars there were in the soil I mixed. It’s not a small amount for sure. Sifting soil is also another hot topic that people argue back and forth about. Again, I’m not taking sides one way or the other. The important part is understanding why or why not to do it. Small particles and dust holds a good amount of water compared to large granules. Since this tree needs drier conditions, we removed a component that holds a lot of water. I talked to Mr. Tanaka about sifting and he said we don’t really have to sift the soil and that his father never sifted his soil mix. The consequences to this is that he had to be more careful in allowing trees to dry out before watering. If the conifers never dry out in between waterings, the roots will slow down and start to rot and die off. On the other hand, removing the dust and small particles will cause the soil to dry out faster. Now it’s not a matter of allowing the soil to dry before watering, it’s a matter of not allowing the soil to stay too dry for too long between waterings. Roots always grow faster in drier conditions, but when the roots are completely 100 percent dry, roots will not grow at all and start to die off. So before you decide to sift or not sift your soil, think about the effects it will cause to the roots in the soil and if you’re able to adjust your watering habits to it. The decision is yours. *Secret side note* (well, not so secret anymore): this year, we sifted all of our conifer mix and didn’t sift our deciduous mix. Guess what, the trees are growing fine. Since the conifers needs to dry out in between waterings and deciduous trees like being wet all the time, it worked out just fine. 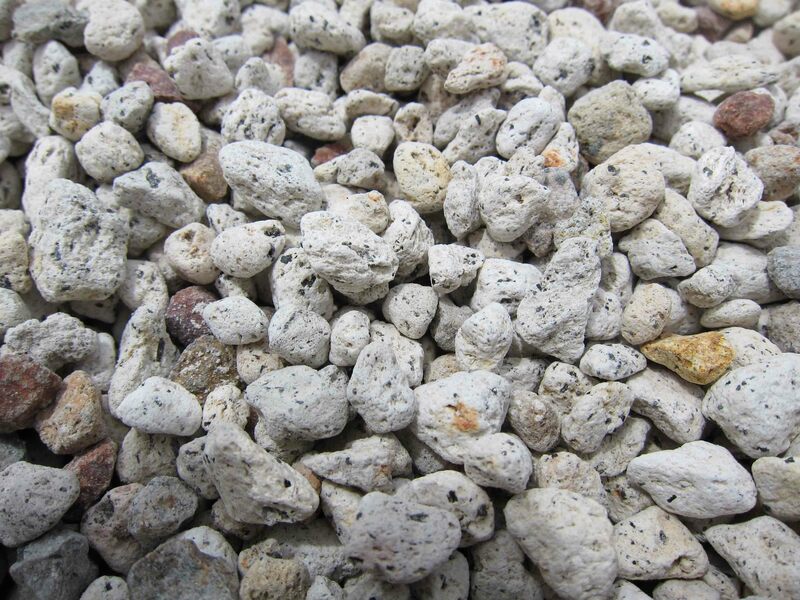 We use this large size pumice for the bottom layer of the soil. Using this large pumice helps keep the bottom of the pot drier so that the roots don’t stay wet too long. It also helps protect the drainage holes from plugging up when the akadama starts to break down. We normally only use a drainage layer on conifers. The bottom of the pot is always the last area to dry out. Heat and evaporation dries the top soil first and slowly works its way down. By the time the bottom of the pot dries out, the top layers may be too dry and roots may have already died off. If we water the tree correctly and not allow the majority of the soil to dry out completely, then the bottom layer will stay wet all the time. 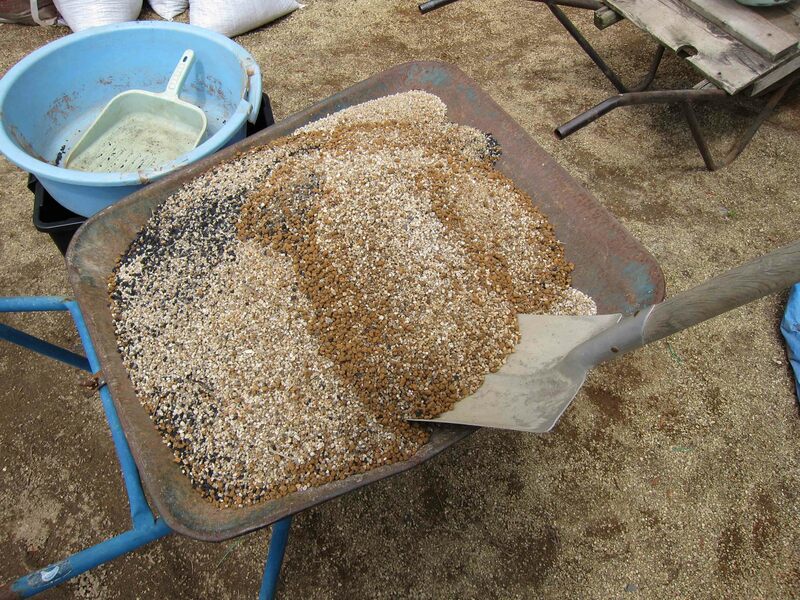 The use of pumice is a great way to keep the soil a bit more uniform in holding/losing water. Here’s another shot of the root ball. As you can see on this side, Mr. Tanaka decided to dig out more of the old soil. That is a huge pot! We decided to change the pot and give the tree a little bit more room to grow. This pot is heavy and weigh just as much as the tree! This is a Japanese Antique pot, which means it’s over 100 years old. For those that are observant you already see the crack repair on the bottom left of the pot lip. This was actually a factory crack from the firing process. Creating large pots is much more difficult than small ones. There’s so much more clay and weight to it. Have you noticed that the larger the pot gets, the price increases exponentially? Risk of deformity and cracking during the firing process is higher so sometimes a maker has to make several just to get a good one out of it. 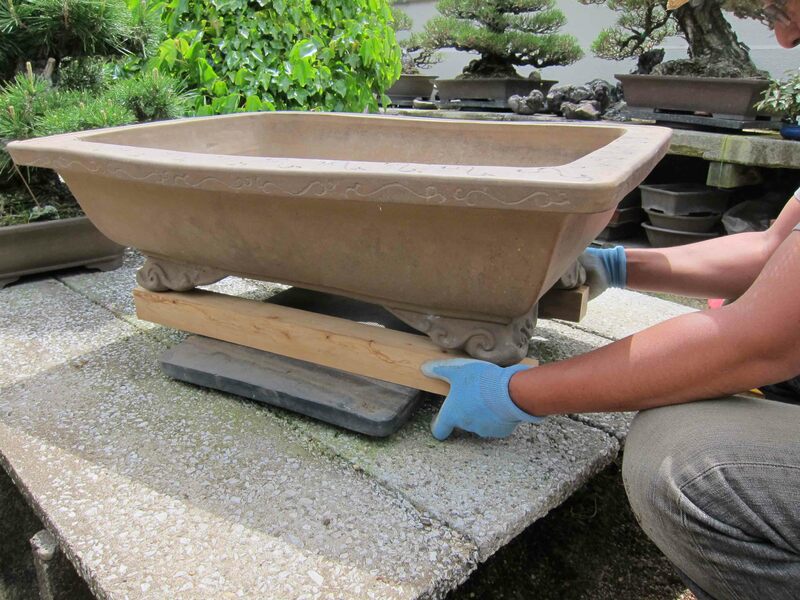 I have yet to see a Japanese Antique pot this large without some sort of factory crack. As I was cleaning the pot and putting in the screen for the drain holes I noticed this little fella. 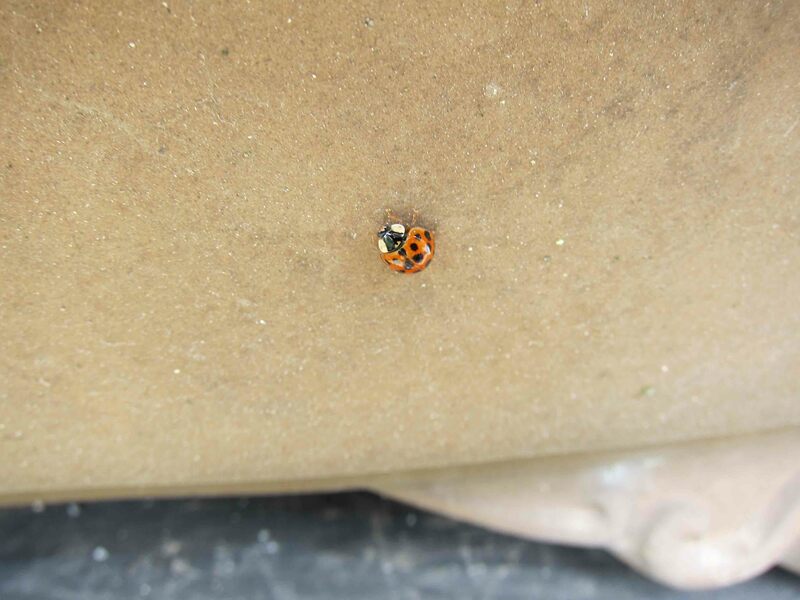 I’m not normally a fan of bugs but for some reason lady bugs don’t bother me. Maybe it’s because they’re so good at eating aphids. ;o) I tend to see more of the ones that are black with red dots in this area. Seeing this guy reminded me of home. Normally the tree is on a plastic turntable. Since the new pot has raised feet, it doesn’t sit right on the turn table. We needed to add some wood to the turn table for the pot to sit on. Here’s Mr. Tanaka cutting some wood. Essential tools of a Bonsai nursery. Spare wood and a pull saw! Positioning it just right. Once the tree is in, we’re not moving it! 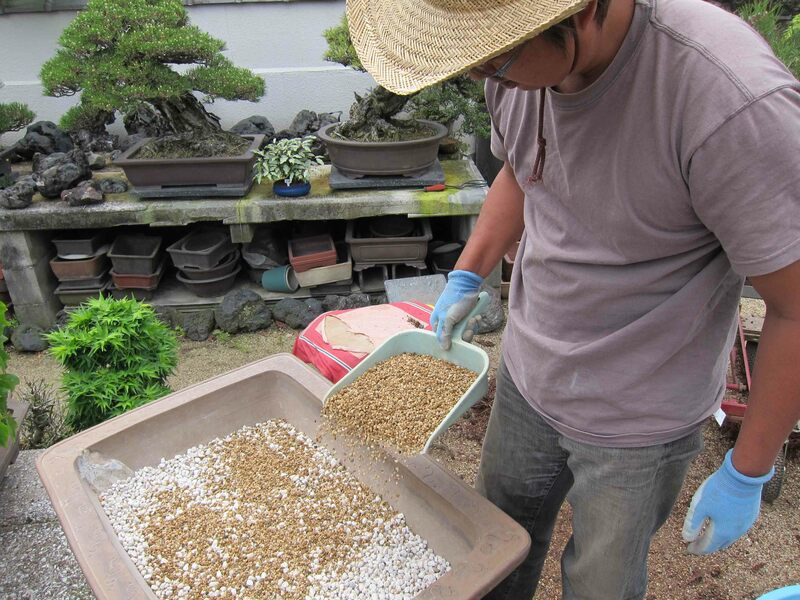 Here is Mr. Tanaka adding the large pumice for drainage. Since the tree isn’t going anywhere for a long time, we didn’t bother with the tie down wire. The tree is so heavy and stable that it’s just not going to move. A car would have to hit it to move it! Or perhaps a Sumo Wrestler! Next he added the soil mix. When was the last time you needed a dust pan to add soil into a pot? With a lot of grunting sounds, Mr. Tanaka and I lifted the tree and placed it in the pot. 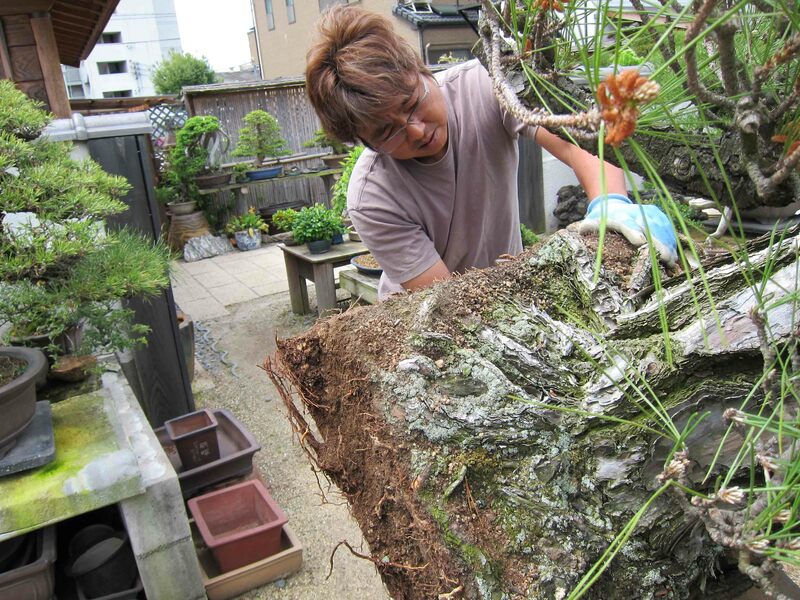 Here Mr. Tanaka is checking and adjusting the position of the tree. The tree is going to like that extra space! A quick shot of the side. Once the position was set, Mr. Tanaka added more soil. Mr. Tanaka then used a pair of chopsticks to work the soil into the roots. Once the soil work was finished, all that was left was to water. We watered the tree until the water coming out of the drain holes turned clear. And there you have it, repotting finished and time for the tree to continue it’s development. The timing in repotting this tree worked out great because a hour later, it started to rain! There are a few reasons why we made the mix for this tree on the drier side. One reason is that the tree is still in development and the drier mix will help accelerate root growth and foliage growth. The other more important reason has to do with the large volume of soil we used. Though the mix is on the dry side, the shear volume and depth of the pot causes the soil to stay wet longer. For the most part, the average Bonsai enthusiast isn’t repotting trees this big so it’s something most of us don’t have to worry about. On the other hand, if you get your hands on a monster like this, then we have to take into consider the volume of soil and it’s affects on water retention. The more surface area soil has, the more water it will hold. Small soils put together in a container will have much more surface area then the same container with large size soil. Knowing this gives us an idea of what size soils we should be using for the various trees we’re working with. 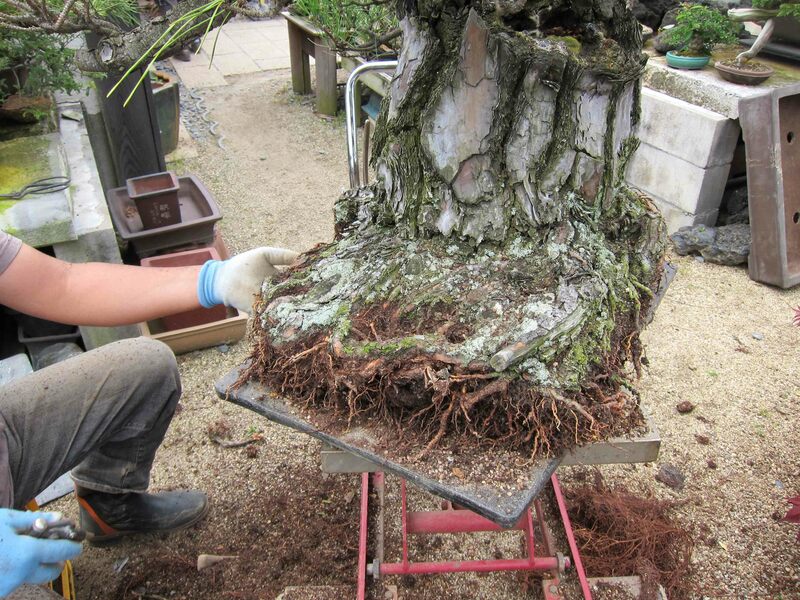 So the next time you’re repotting your prized shohin Trident Maples, using large soils isn’t the best idea. 2. Developing the branch structure: During this stage of development, we don’t need the tree to grow as vigorous as before. The soil mix at this point starts to change and becomes a wetter mix (think of Soil Law #1). In this case, the akadama is usually increased in the mix. 3. Refinement and maintaining shape: At this point, the trunk and the structure of the tree is done. It’s all about maintaining the shape and increasing ramification and density. The soil mix at this point has a lot of akadama and stays wet the longest causing the new growth on the the tree to grow slow and short (Refined trees at Aichien using about 90 percent akadama and 10 percent hyuga). Though the increase wetness of the soil goes with the increased development of the tree, there is a fine line that can be crossed and the soil mix can do more harm then good. Here is where watering techniques come to play and why it is so important. As I go from tree to tree, I have to focus on what kind of soil mix it is in, type of tree (needs more or less water), the time of year and if it even needs water at that time. 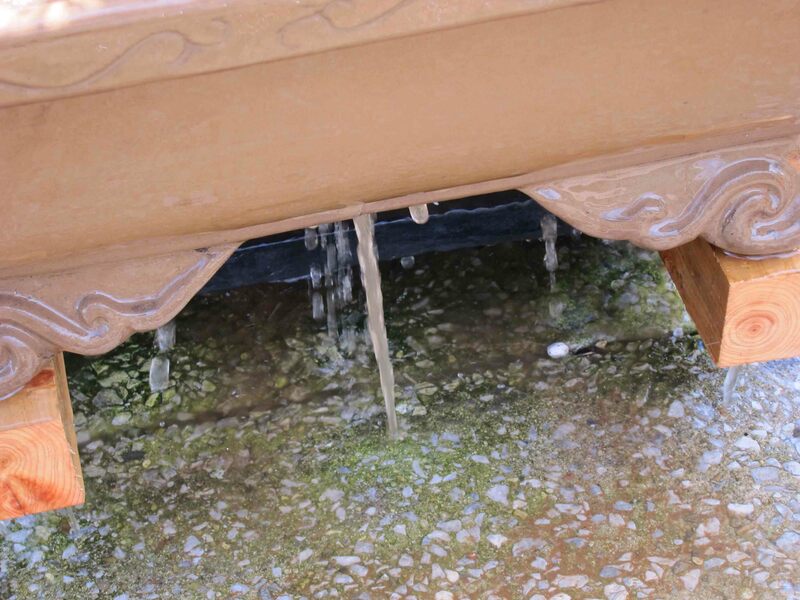 Winter can prove to be an especially difficult time to water because of the cold weather. Overwatering trees in the Winter leads to root rot. Unfortunately, the tree will not start to show signs of decline till the Spring which at that point is already too late to adjust your watering technique. Here’s a picture of me watering during Winter. Notice how I’m not smiling? I have yet to see any professional or apprentice smile while they’re water trees. It’s challenging because so many things are going through my head while watering and on top of that, I have to monitor the health of each tree (plus it was cold). Also the last thing I want to do is accidentally skip a tree. There are trees in the yard where one missed watering on a hot day will kill them. Having said everything so far, we have to come back to reality. I’m apprenticing at a Bonsai nursery and I’m doing it every single day. That is not the case for the majority of Bonsai hobbyist out there. We all have lives and Bonsai is not always number one. Because of this, using the most ideal soil mix doesn’t always work out for everybody. Before I started my apprenticeship, I had a 9-5 job just like most people. That meant I was either going to water my trees in the morning or the late afternoon, and sometimes both. Since my watering schedule is limited I needed to adjust my soil mix to accommodate it. For most of us, that meant using a mix that holds more water and we get by with that. Of course, by doing this, we do have to realize that there are consequences to it as well (think of Law #1) Since the trees are staying wet longer, the development of the tree will slow down. It’s not necessarily a bad thing, but more of a realization that our trees are only going to be as good as the effort we put in them. For example: I can only water my bonsai are small and can only water every two-three days. Just about the only thing that holds that much water for that length of time is 100 percent potting soil. The tree will grow using it and I can get away with watering every other day or so, but will the tree develop as fast or as well as a enthusiast that maintains the tree everyday? Most likely not. Is one right or wrong? Not really because both are still developing bonsai at the end. It really came down how much effort and time one decided to put into their Bonsai. Knowing this, we continue to do the best we can with what we got and feel satisfied that we’re still creating Bonsai. Cases where the cost of soils are too high or the inability to keep up with its watering schedule could lead some of us to more unconventional soil mixes for sure. 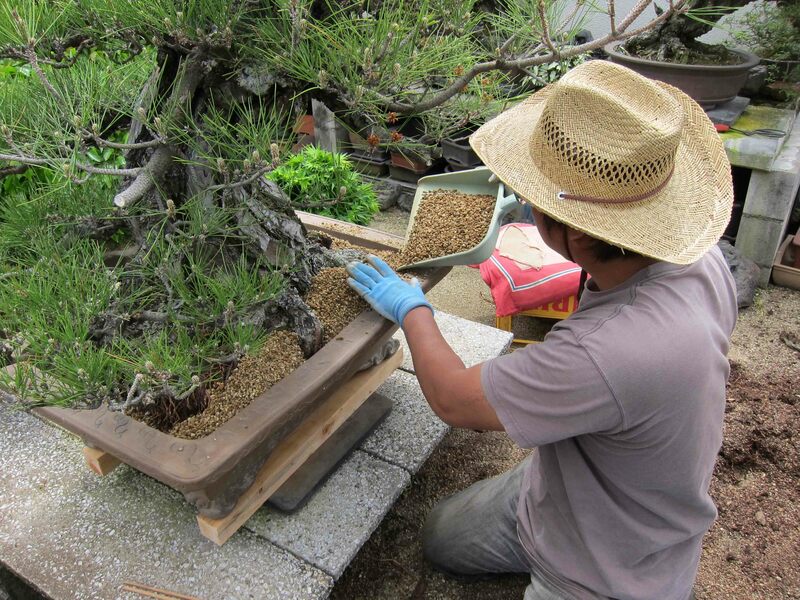 That is perfectly acceptable to do in Bonsai and many have done the same in Japan. The important thing to understand is how the water retention of the soil affects the growth and development of your trees. If your mix is working well for you, then by all means, continue using. Now that we respect each other, lets also open our own minds and learn from each others experiences and take the best part of them and continue to make Bonsai better and better! I’m tired of arguing…. aren’t you? If you ever wondered how pine cones develop on a Black Pine, here is how it happens. Pine cones on Black Pines take two years to fully develop. Take a look at the photo above and you can see two sizes of cones. The small reddish cones are new cones forming on the tops of the new candles this year. The bottom larger cones use to be just like the small red cones one year ago. In the Fall, the larger cones will mature and release its seeds. Here’s a closer shot of the new pine cones. Note how the largest strongest candle has three cones and the small candles have two? Stronger areas on the tree will always produce more of everything. The development of Pine cones can be a huge drain on the tree though, so many times, people that see them will twist them off. This way, the energy that was going to the pine cone can go to other areas of the tree. For fun, here is what a new Bristlecone pine cone looks like. Pretty! If you are happy with the contents of this site and would like to show support, please click here or the, “Your Support,” tab in the menu for more information on how you can help me maintain this site and my apprenticeship. Thanks! In a recent post on Pines you refereed to de-candling in Summer I think…….I have a fair grasp of pinching candles to balance energy,,,,,needle pulling……de-budding………but as the Spring candles have become elongated shoots by Summer ……why is this referred to as “De-candling”…….and is this exclusively a silhouette maintenance pruning activity? Please advise whenever you can. 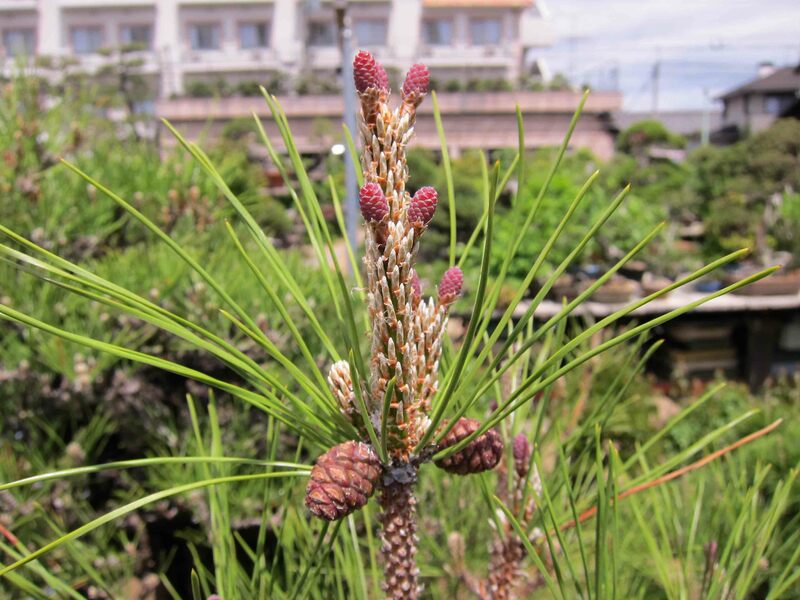 White Pine in my collection producing numerous cones…….will twist off as you recommend. 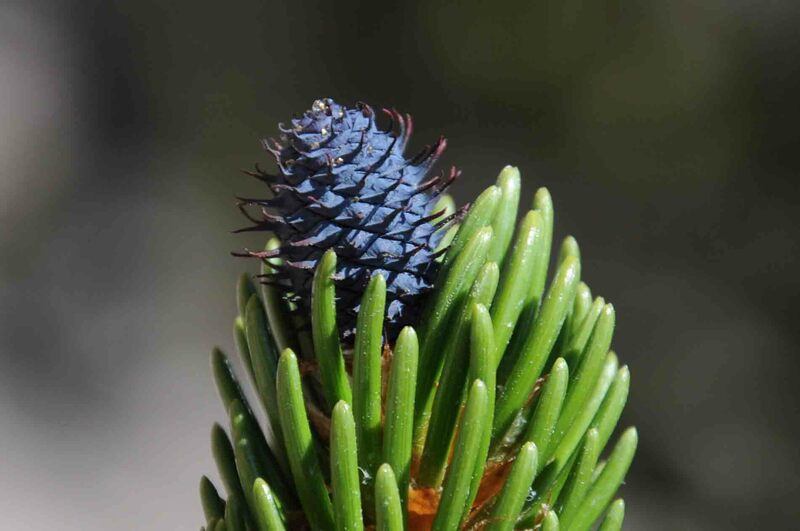 The technique you are describing is used mainly for five needle pines and high mountain pines. De-candling is only performed on Black Pines which are coastal trees. On Black Pines, during the Spring as the candles are elongating, there is no pinching done to them. The only exception is when a candle for some reason is growing very vigorously and strong. This of course will cause the branch to thicken. In those cases, you can pinch the tip off the strong candle just to stop it from elongating and thicken. Then once de-candling times comes around, you can then cut off the whole candle. In June to July, black pines are de-candled for three reasons. It could be for one or for all three reasons. Essentially, by cutting the candle in the middle of the year, the new candles that grow out from the cut point will have shorter stems(necks) and there will be multiples of them. Since the new candle only has half a growing season (June-November) the needles don’t get a chance to grow as long as they normally would. Once November comes along and the new needles have hardened off, you can go through the tree and pull the old needles out and reduce the new candles(shoots) down to two. The term de-candling is used in Japan as well because we cutting the entire candle off. Shoot pruning is more when new shoots are cut back but not cut off completely. This technique is used only when the options above are desired. If the tree is weak, de-candling will not yield good results because it is a stressful process for the tree so the tree needs to be nice and healthy. Normally the trees are fertilized heavy in the Spring to prepare the tree for de-candling. If the tree is still in development such as growing main branches or the trunk, this technique does not apply. So, if this technique was used for white pines or other high mountain pines, for the most part, they will not grow new candles within the same year. Only small buds will form and they will start to grow the following year. In the coming weeks, we will start de-candling here and I will write a post talking more specifics on how to cut and when to cut, etc. Thanks for sharing. Next to you always learning!!! Wow, discussing soil properties is like opening a huge pandora’s box! A big plus with akadama is its ability to help feed the roots. Akadama has a decent cation exchange capacity. In english that means that as fertilizer breaks down, it breaks down into ions. The akadama has positive ions that capture the ions from the fertilizer passing thruogh the soil as you water. The trees roots can now use them for food as it pleases. Pumice, lava, etc are not able to do this. Prganic components do this well, but then alot of people don’t like using organic soil for many reasons. I’m sure there is an inorganic local replacement for akadama that would be “dirt cheap” thats probably under our noses and has a high cation exchange capability, but we just have not found it yet. I’ve always wanted to try Akadama, but it’s so expensive here in the States. I’ve tried a number of substrate substitutes, such as kitty litter, but it all seems to break down too quickly. Recently, I’ve found a good cheap replacement in Diatomaceous Earth. It doesn’t break down very easily, is quite light, and holds a lot of water for a short period of time. I get mine from auto part stores, as they use it as an absorbent for oils, grease, etc. It comes in 25lb bags for about $9.00. I wonder if anyone else on here has tried using DE. In any case, GREAT article Peter. I always look forward to reading your posts!! I am using DE as part of my inorganic soil component, which now also includes LECA. 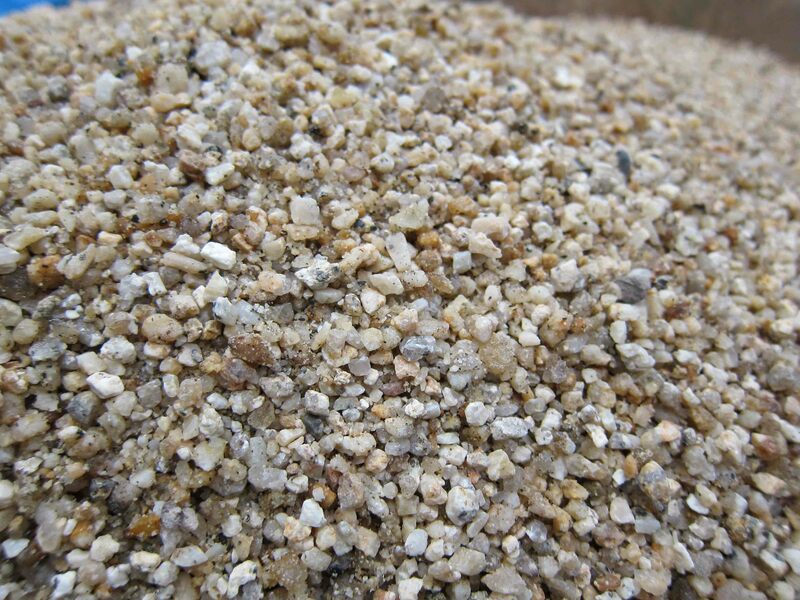 lava rock, zeolite, and stone sifted from “stone dust” used for laying pavers or patio stones available in stone suppliers. 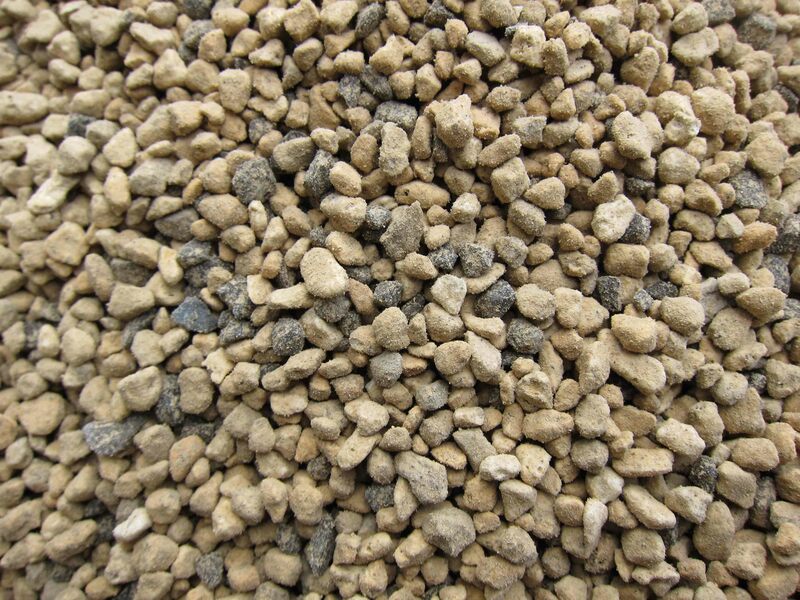 Zeolite is a good material, but too expensive in the east US, and will phase out of my mix. Same with haydite. To this inorganic mix, I add a very small amount of charcoal and composted pine bark in amounts suited to different species. Wow! That’s exactly what I do too! For conifers my mix is 70% DE, 20% Fine Fir Bark (I like reptile bedding the best) and 10% Horticultural Charcoal. Then I sift. For deciduous, I don’t sift. Good to see it’s still possible to maintain healthy trees at a reasonable price on both the east and west coasts! 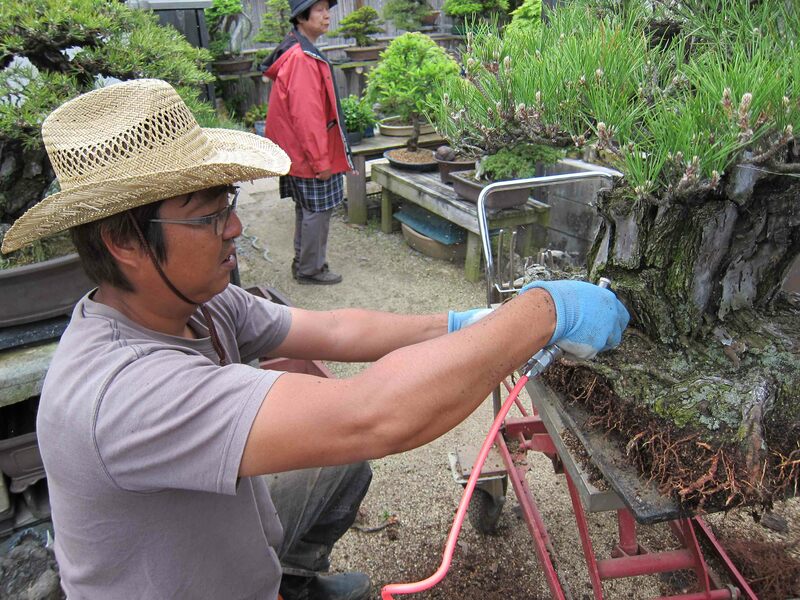 I am a big believer in Fir Bark having learned this from Brent Walston at Evergreen Gardenworks…………but the only size we have here is for orchids about 3/8″-1/2″……..is the reptile bedding smaller? Manufacturer / Supplier? I had an old lizard lounge I used all the old bark from. Mine was like half inch. Thinking about putting it in the blender. Petco had some on sale a month or 2 ago….. However, Dave from Dave’s Pets and Stuff in Oak Park is a plant guy, he could probly source it cheap. Good Cat. Wonderful post. I have learned a great deal from your posts. The information is trustworthy. Your photos explain a lot in addition to your words. Keep it coming and I look forward to meeting you once you return home for good. Peter, did you shade the pine with shade cloth after repotting? We did not shade the tree after the repot. The daily temp here is is about the mid 70s so not really hot yet. Black Pines can handle a lot of sun. Keeping it in the Sun and allowing the pot to warm will actually help the roots grow faster and recover from the repot. If this tree was weak and sickly, then we would have gave it some shade. Help i clicked follow-up comments and have an inbox full of everyones comments!! As always another great post Peter, i think the information your putting out is great. I believe the more trees one has the more soil and mixture they will make these are great tips to help anyone fine tune their mix…What no sifting!!! Glad you mentioned that people have to be careful depending on where they live. OK so we always hear no mater what “tie the tree to the pot”. Is this tree just to big to worry about it getting blown over? 1] With brick hard soil like this one displayed at potting…..how long do you water a tree in this condition to “wet” the soil? I have watered Turface for 5 minutes only to stir it afterward and find 1/4″ below the surface is 100% dry. I dislike Turface as it exhibits high water retention owing to its size and composition when wet and when it does dry out is very difficult to make wet again…….but its $8. 2] Your 4500+ word post, while excellent, did not mention what type of Japanese Black Pine this is? 3] At what dimension is this trunk inappropriately large? What if it were to be another 12″………does it become even more spectacular. I confess that it looks more like a stump with foliage with no appeal at all. I realize the Bonsai community considers this sacrilegious. 1. Though the soil looks hard and impenetrable, it is actually still somewhat porous. Usually I let water pool on top of the soil and it makes it’s way through within a 1minute or so. Of course, that’s the case with the soil we use here. 2. 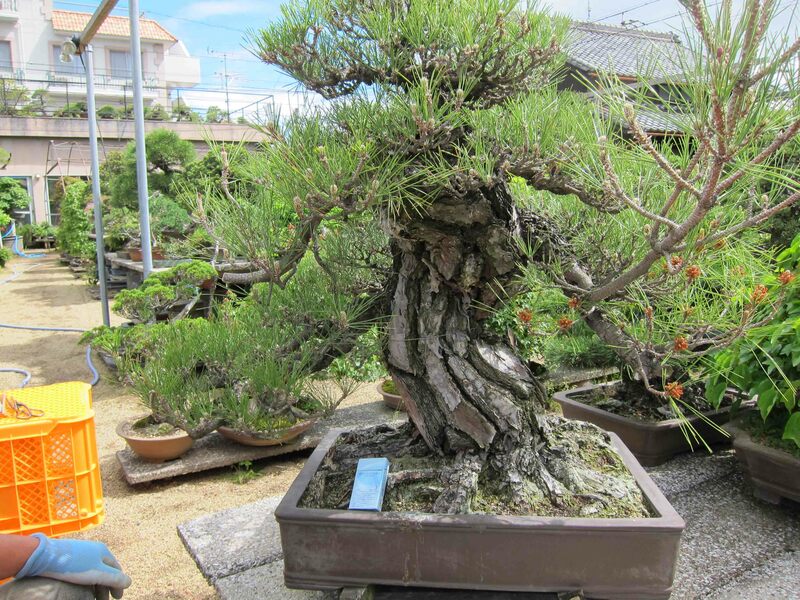 This Black Pine is a Awaji Black Pine collected in the island of Shikoku. I would stress though, that I have yet to hear a single person call black pines by where they’re from. 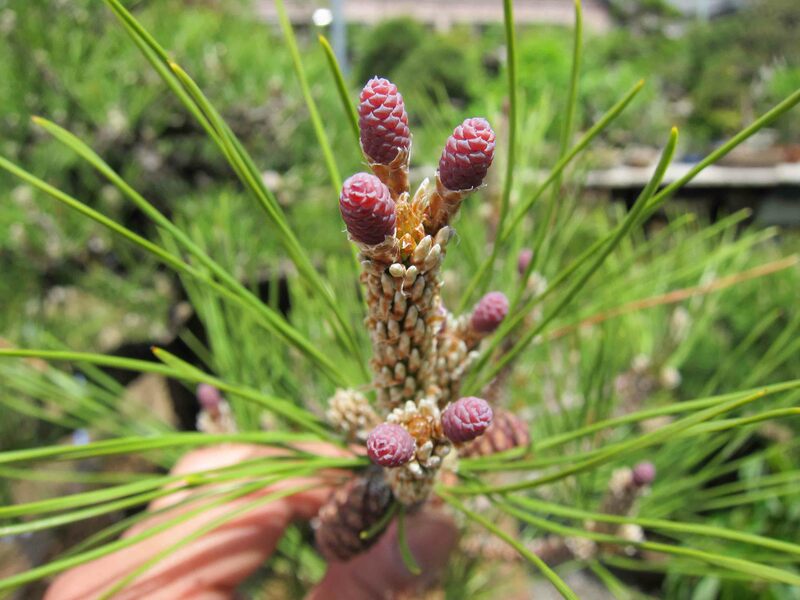 To most people here, a Black pine is a Black pine and they don’t put any emphasis on mikawa or awaji. It especially doesn’t affect the price of a tree when that info is known as well. It’s all about how the tree looks as is and if it has good bark, then it’s valuable. Not all mikawas or awaji will develop great bark. 3. The trunk on this tree is starting to push the limits though is still considered Bonsai. There has been trees this big that has won kokufu before as well. Usually 3 feet is about the limit on the height for bonsai. Literatis can be an exception to that sometimes. You are correct in your observation that this tree looks like a stump with branches coming out of it. The transitions from trunk to branches is poor at this time and needs a lot of time to develop. Hence, the 50-60 year time frame Mr. Tanaka gave me. The reason why this tree is valued is because of the age of the tree. We gotta look at the tree for what it is and appreciate it, as is, as oppose to relativity to other trees. Also, collecting a tree that is this old and this size is actually very rare. Most naturally growing black pines that develop this thick bark is HUGE and way too big for Bonsai, so the rarity of finding a old tree with a trunk this size with such thick bark. A nurseryman could try to grow one but it would take 200 years to duplicate this trunk. Your opinion of this tree is your opinion and I respect that. People will always have different feelings about trees and I actually appreciate it when people say what they feel and think instead of going with the group. At this point, I agree with you. Other then the thick bark, there isn’t much to the tree, yet. It will show us in the future if it will be a great tree or not. I use to feel the same with with Ezo spruce when I see them in books. I was like, eh, doesn’t do it for me. But once I got to know them and appreciate how long it takes for a trunk to get that big and that the foliage grows less then an inch a year, I at least started to respect them for what they were and now love to look at them. Seeing the trees in person made me feel tiny compared to what this tree has seen in its lifetime and the lifetime after I’m long gone. Same when people back home use to open up the kokufu books and see a formal upright white pine and say, “cookie cutter tree.” But I guarantee if they were to see the tree in person or understand how difficult it is to create, they would be in awe. Well Daniel, here is your nice short answers. LOL Thanks for the question and comments. I think people benefit a lot from the comments section alone. Everybody is asking good valid questions and serious about learning and understanding! It makes me even happier that I know there are good people out there doing what I love to do. Thank you so much for this great post Peter. All of your articles are interesting but this is the best thing i’ve ever red about soil mixes and how to water bonsaï. 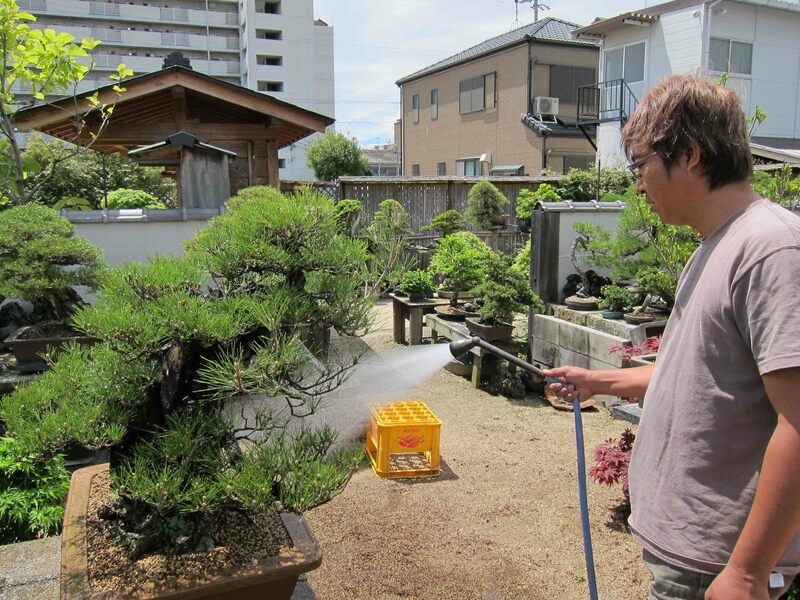 Two years ago, while i was visiting Mr Abe garden in Fukushima, i’ve been very impressed to observe him (who is a very smiling and funny person) being so serious and concentrated while he was watering his trees during a hot afternoon in May. 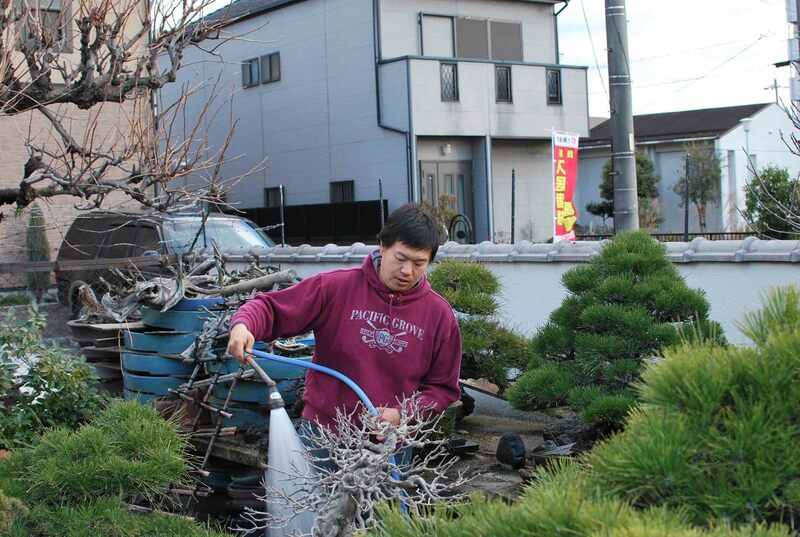 He waters his trees for probably more than 50 years…. So, thanks again Peter for this great post. Thanks for sharing and for improving the western bonsai world. Thanks Peter, a great post. We very much like to follow your experiences. Great read prior to getting up for the day. It makes me think for my personal growth should I have oatmeal or dry cereal? Peter, thanks for a great piece of work. Agreed with u 110% that bonsai mix varies with so many factors including micro climate and personal watering habits. No use arguing over it. I am surprice that JBP cones take two years to mature in Japan. In Perth, WA my JBP cones matured within the year. I have successfully harvested and seeded them. This goes to show the importance of climate in the growth habits of trees. Wow CJ! That’s the first time I’ve heard of that. 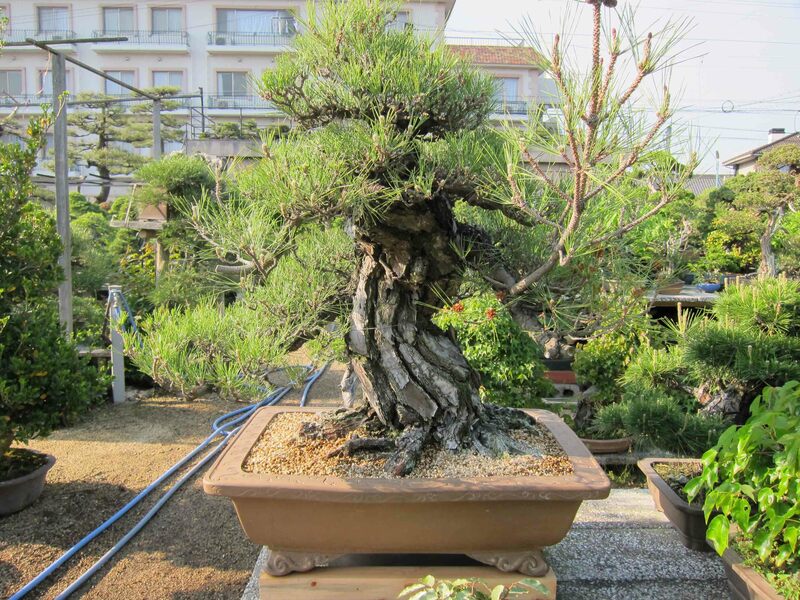 I agree with you whole heartily that understanding the climate is huge when developing Bonsai. Thanks for sharing! Peter, I will read this post many times, so many important informations! While I absorb all I can from this one, may I ask you a post about tools care? cleaning, sharpening, keeping than in good conditions are all few available information. The concave cutters are specially dificult to me. And what to do to correct when the blades of a lateral cutter do not fit (bite) together any more? Thanks again. Zack, Go to a Lowes building supply. Go to the electrical department. Then look in the industrial electrical area for a block of electricians putty. It usually is hard to find so you may have one of the worker bees to show it to you. You get a one lb. bar for something like $6. I haven’t bought any in years, a pound goes a long way so don’t hold me to the price. It’s gray, it weathers very nicely, gets a little darker. Never drys out, easy to put on and easy to take back off. I keep the big block in a plastic container and pull off a wad and put in a smaller container like a pill bottle from the drug store. When the small supply dwindles I just go back to the large block and get another wad. The only trick to using it is to make it stick to the wound on the tree you need to lick your fingers so they are damp or the stuff will cling to your fingers instead of the tree. Been using it for years and have absolutely no problems with it. Thanks for the tip Mac! There are situations where I use the putty that you recommend. The next time I’m home, I’m buying myself a pound of electricians putty! Great post Peter. Keep it coming. Lots of information on soil that most beginners like me don’t really think about when we first starting out. Off topic, but in the last Bonsai Tonight post Jonas talked about you guys using something called Joint Compund-A for cut paste. Is it for Bonsai or is it a pipe joint compound for sealing threads? Kind of like plumbers putty? It looks good for use but what am I looking for in the US? Hi Zack, it seems that Jonas beat me to the release of this stuff. It similar to liquid cut paste but it’s so much cheaper. In Japan, it’s used to seal corners during the wallpapering process. We can buy it many different colors, though we usually go with the brown. It’s like 5 dollars a tube and works just as good at the liquid cut paste that is sold for bonsai which is about 70 percent less but 5 times more in cost. It is wet and gooey when applied but when it dries becomes soft and rubbery. Very ideal stuff for callus to form. I like using it as opposed to the thick doughy stuff because it’s easy to use and sticks to anything you apply it to. If I find product in the US in the future, I’ll be sure to share it. Thanks! Fantastic post! Any idea which grafting method was used to form the branches on such old wood? That I am not sure. It can be difficult grafting on material like this because there is so much bark in the way. Usually people have to end up removing the bark just to get the graft in there. Approach grafting seems to be the best way these days but I would be surprised it was a side graft or a tongue and cheek graft. Thanks! Great tree work and soil explanation. In our beginners class I always tell them that in a room of 10 bonsai enthusiasts there will be twelve “best” soil mixes. I then tell them that the best soil mix is what works for them, in their yard, with their trees. I share my recipe, and point out that I am one of the few people I know that uses coffee for the organic component. It works for me. I have heard of people using coffee grounds in their gardens but never in Bonsai. Thanks for sharing Zack! As for the coffee, it is used grounds in many grind sizes. I have a coffee club at work and supplies varies by who is buying and is not decaff. It works best in shohin size soils and the potting up after cuttings are rooted. It makes maple roots go nuts in a 1:2 coffee:turface mix. 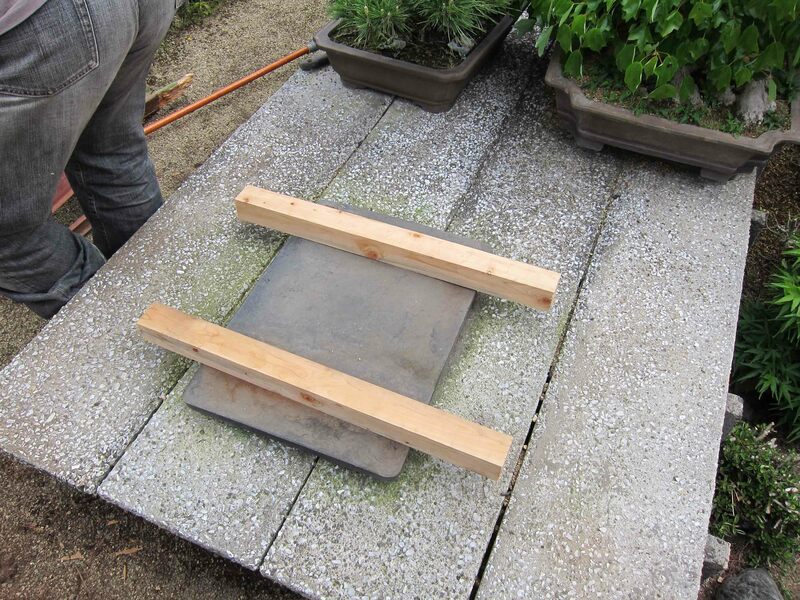 I am experimenting right now with the material used on green roofs – where the roof is planted with xeriphytes in about 8 inches of what looks like coarse bonsai mix. – 5 to 15 mm size. In Ohio I get something called Hydrocks. Some have compared it to an expanded shale product called haydite. It appears more lava like to me but is definitely a man made material. I’ll look in a couple of stores for the wall paper seam sealer and let you know if I find anything. Thanks for a great post Peter! I kinda knew some of this stuff, but not any way near the extent that you described. When we had a drought in California, the only thing I knew to retain water was an organic component like sawdust or compost. I now know it was not a good idea, but the trees survived. Geez man, we could not be anymore lucky to have you writing great articles like this. I keep learning a lot! I also really like your attitude about not arguing about soil. Does Hyuga seem to hold the same amount of water and function the same as the white pumice that you find in the U.S.? When you come back to the States, will you sub our white pumice anytime you would normally use Hyuga? Thanks for the support and the kind words. It seems like in every facet of life, people always prefer to argue instead of actually accomplish anything. All the while, someone out there is in their workshop or backyard creating something beautiful. Believe it or not, that’s what people wanted to do in the first place when they got into Bonsai, but somewhere along the way they strayed from that goal. I feel that it’s my responsibility as a promoter of Bonsai to do my part in reminding people that it’s about Bonsai and we should be enjoying it, not fighting each other over it. As for the hyuga questions, it is a yes. 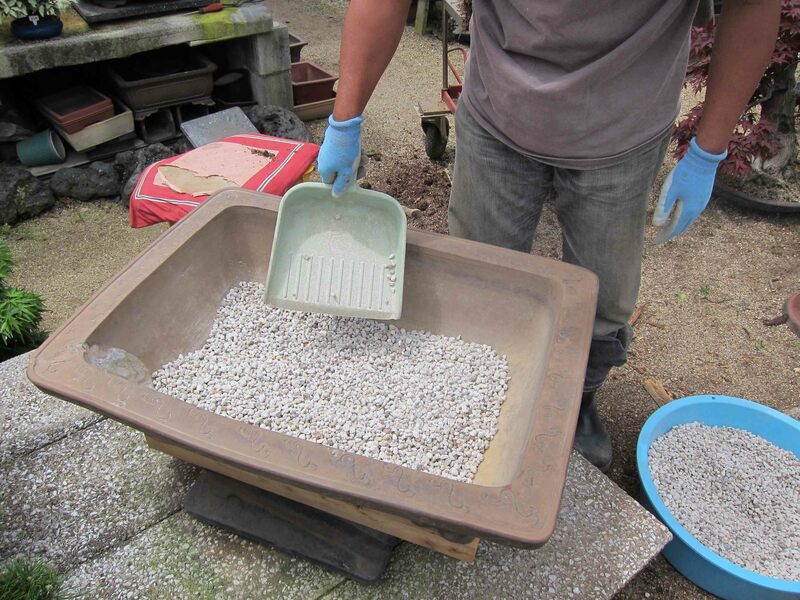 I would use regular white pumice instead of hyuga when I was mixing my own soils. They both work about the same though I think the US pumice is heavier. Once I started using Clay King, that Jim sells, I stopped making my own soil. If I did need to dry up the soil, I would add some white pumice to it. What role does red lava play in a soil mix? Red lava is nice to use because it can hold water through surface tension in the tiny holes that they have. They are also sharp which helps roots divide and form a better root mass. 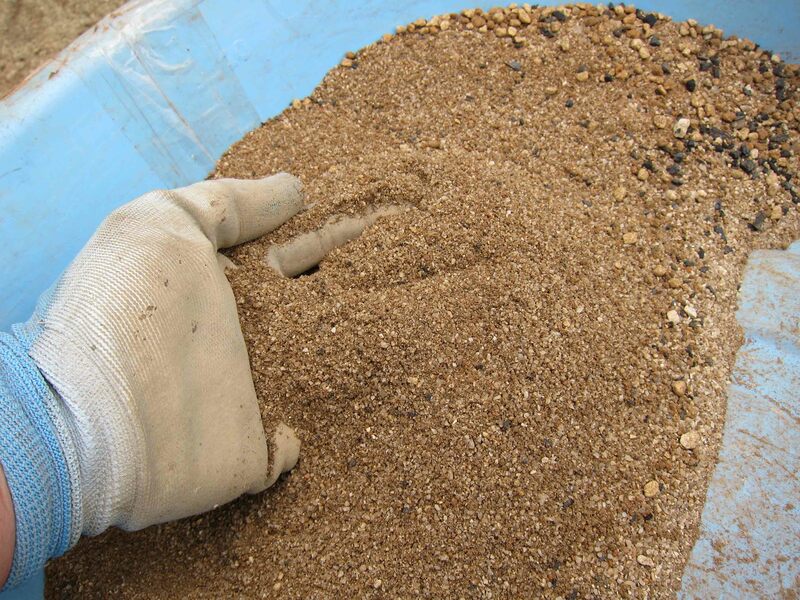 The coarse river sand we use here is sharp but not a porous so it doesn’t hold as much water. Great post as usual! Akadama here on the east coast is now going for $45/bag (!) so many of us are searching for alternatives for the water retentive component. I switched to Boon’s mix this year and it seems great except it may not be as compatible with a full time job and deciduous trees as I thought. It seems to dry out fairly quickly. This worries me for the hot summer months but I think i nthe long run with some adjustments it will be much better than my past mixes. Do you also cover the soil with sphagnum moss (Mizu Goke?) for a little more water retention in the hot summer at Aichi-en? 45 per bag is rough! I’d be searching for something to use as well if I had to pay that!. I never quite understood the pricing for it in the US but I have a feeling it has to do with Supply and Demand. LOL I’m hoping that someone in the future can either pool people together to get a whole bunch of it and bring the price down. I wouldn’t mind be apart of that! Boon’s combo mix works well and trees like it very much. I was using it as well. In the Summers, I did have to add moss to help keep the tree from drying out though. Here at Aichien we use more Akadama so the trees don’t dry out as fast. We don’t use the moss during the Summer because we’re always here to water when the tree needs it. If people can’t do that (and I understand most can’t), I would definitely suggest using the sphagnum moss to protect the trees during the Summer months. I have heard people using 50 percent akadama in the north East to help with the water lost problem. Trees seem to grow just fine. Once you get into the 70+ percent range in akadama, you may need to be a little bit more careful with the watering. Thanks for the comment Chris and good luck! Gotta agree with the other comments Peter, very well written and thought out. I find for me that some of the components I use, Turface/Lava/Pumice, I’m not exactly sure how much retention there is, nor breakdown of the components. 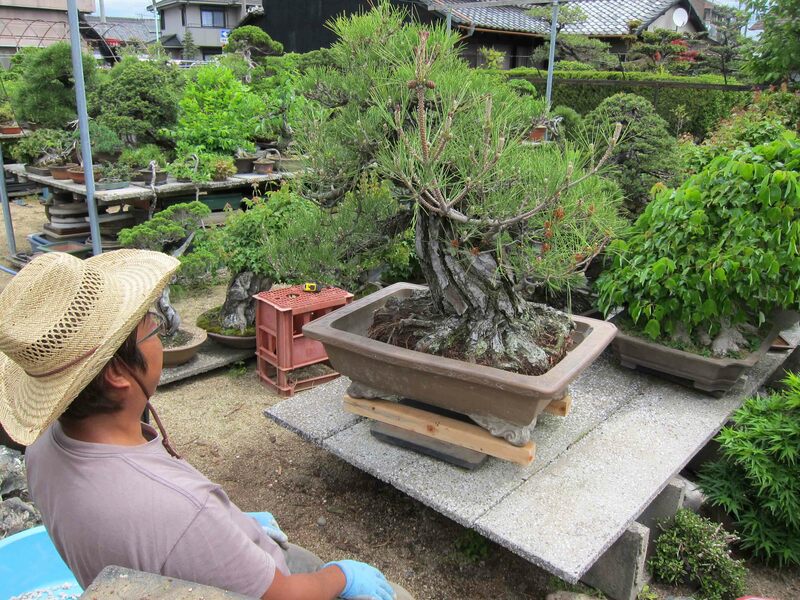 Since you were growing bonsai before you started your apprenticeship, maybe you might have an idea? It’d help me a lot to understand better how to improve what I use. Before I came to Japan, I was using Akadama, pumice and lava. I have heard about people using turface as well but have yet to try it myself. The last time I saw someone using it, I noticed that it tended to be fairly small in size. It seems like they hold a good deal of water but don’t really break down very easily. I believe what you’re using is okay but depending on how much turface you’re using will change the water content of the soil mix. If you’re going for a drier mix, I would either use less turface or larger sized turface. Many times in the past when I see people’s trees that aren’t doing too well, it usually tended to be that the soil mix, whatever it was, was too small in size and caused the mix to hold a lot of water. Add that with overwatering the tree and you have a sick tree. If you’re trees are growing well, then by all means continue what you’re doing. If your trees seem a bit on the slow side, it could be either the soil is holding too much water or overwatering. Usually what helps most people in adjusting their soil is making it a bit more on the dry side to prevent the overwatering and go from there. If the soil seems to dry out too quickly, then adjust again. In no time, you’ll start to find that perfect combination that will work with you and your area. That makes sense Peter, Thanks for taking the time to respond! This is my first yr. trying varying proportions of Turface/Lava/Pumice. Now I have a much better idea of what to monitor for. I have a few with a 2:1 Pumice and Turface and these do dry out quicker. Too soon though to see any generalized health issues. But it’ll be interesting to see over time. Btw Peter, when you said “medium size hard Akadama”, are you referring to the Double Red Line version of Akadama? 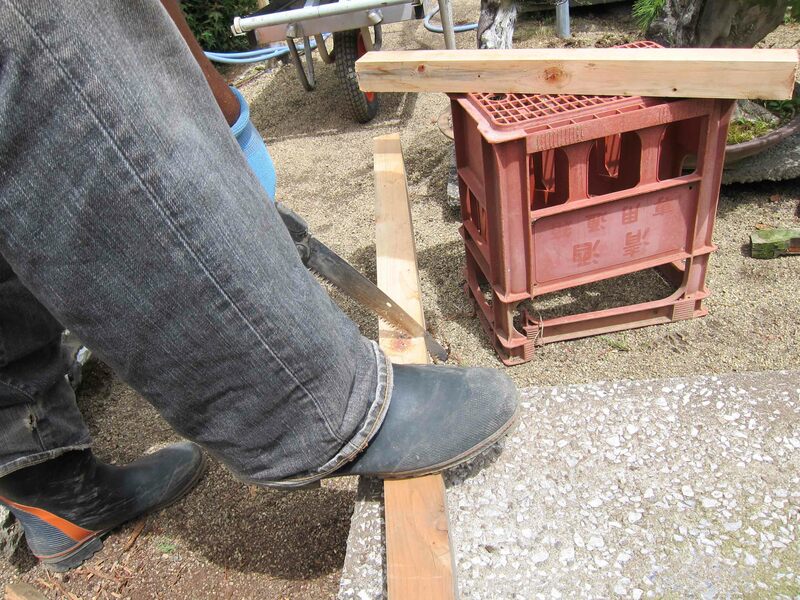 The Akadama we use is not the double read line but is similar to it in hardness and quality. Excellent post, Peter. This is what I’ve been waiting for to learn the concept of making Bonsai Soil. You’re not only make it very easy to understand but so simple for the Bonsai Soil Mixed. There is one thing I would like to learn more if you could share with us that how you water this Beast during this time with Nagoya Climate? Thanks Peter. Thanks for the comment Tung! That is a good question! Even though we used a fairly dry soil for this tree, Mr. Tanaka still instructed me to be very careful in watering it. When it’s time to water all the trees, and I come to this one, if the soil is still wet, I will either skip it or just lightly give it water. Once Summer comes around and the soil really dries out quickly, I will be more giving with the water. Thanks Tung! WHAT A GREAT TREE PETER. THANKS FOR SHARING THE DIFFERENT SOILS AND HOW THEY WORK AND HOW PEOPLE NEED TO UNDERSTAND OTHERS PEOPLES MIXES AND WHY THEY ARE DIFFERENT. Refreshing view of the theme thank you for sharing, a problem with new additions to the collection is always the unknown condition and mixture of the soil. It encouraged me to repot every new tree . Great post Peter and Great Job!!!! Keep the posts coming. What a monster of a tree. Love the bark. Interesting you used a drainage layer I do as well, but a lot of people seem to frown on it. Thanks for sharing another amazing tree. Peter this has to be one of the best descriptions of the considerations given to create a proper potting soil for bonsai. Many thanks for taking your time to document this process and making it available to all who want to read it. At some point could you address the timing of re-potting pines? Did Mr. Tanaka see some sign on this tree that it was the proper time to re-pot? Or was it just spring time and everything else was done now we do this? That’s probably one thing I should have added to the post. 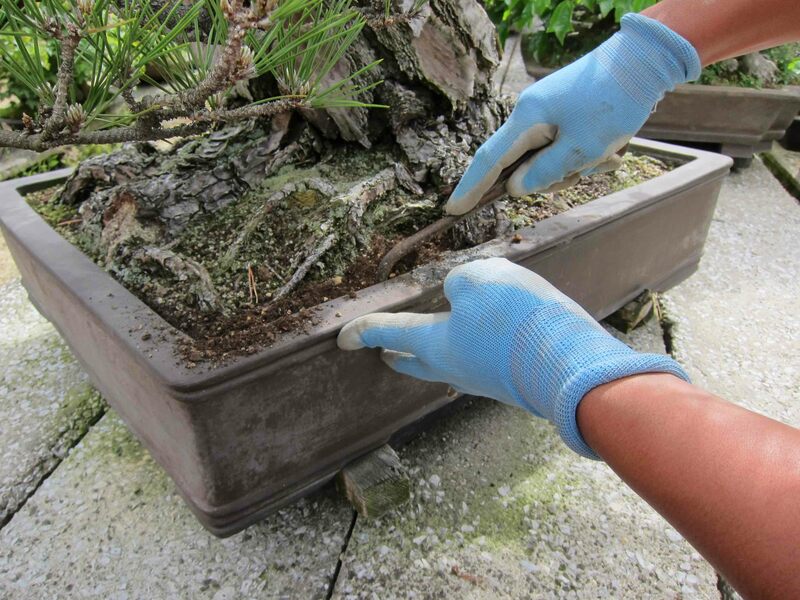 Since we all live in different environments, the repotting time for Black pines can vary by several months. Early Spring seems to be the best time but I would suggest doing it when the nights no longer freeze. In Japan where it freezes at night till March or so, the repotting for them starts at the end of March and through April. We repotted this tree in May, which is a bit late, so we didn’t get too aggressive with the roots. In San Jose, California where the nights almost never freeze, we were getting away with repotting the trees in December! I would recommend Jan-Feb.
One thing you can look for is when the new candles start to move, you can go ahead and repot the tree. Thanks for the comment Mac and take care! This is a fantastic post. I truly am astonished how you can put together such large informative and captivating articles. Can we see a book coming together someday in the future? I look forward to any future post on this massive pine. As it is a tree in development, it would be great if you could follow up with the processes and techniques Mr. Tanaka and youself use in the designing and refinement to the point where it can be regarded as ‘finished’. There appears to be much work to be done to develop the branches and I’m sure many would love to know how this is done. Anyway, as I will be there with you next week, it will be one of the first trees I check out! Thanks Peter and see you soon! Hi Mark! You are correct in your observation that the branches need a lot of work. It’s not just a matter of developing branches and ramification, there’s the aspect of time when the branch actually looks older enough to match the trunk. I playfully asked Mr. Tanaka if this tree could win Kokufu-ten in the future and he said, it’s got the trunk, but the branches would take 50 years to mature to the point where they transition smoothly from the trunk. Ouch! Perhaps beyond our life time, but great for future generations in bonsai. I don’t mind doing my part! Thanks Mark and I’ll see you soon! Wow… what a great tree and what a great post. I had wondered how you would repot a tree like that when i visited and now i know! Thanks for keeping up these posts i am learning a heap reading over them as i am sure mos tof your readers are. Its so good to get a glimpse of the apprentice life and learnings for those who cant do it them selves. Thanks Peter for the informative post, We were discussing Akadama substitute on the Bonsai Study group forum and I told them we don’t have the priviledge of having akadama in South Africa and I gave them our soil recipe and I think it is the most common recipe without using akadama and people should realise akadama is not a wonder ingredient but a soil native to Japan. Wish I had a tree like that to play with. What is the South Afrcan soil mix? We in the USA don’t have native akadama either, and are looking for a substitue. I too would like to know the mix that you are using. I would agree that Akadama is not a wonder material but it does have it’s useful characteristics that seems to work pretty good. I have tons of experience working with it so I like to use it. I know plenty of people that are developing good bonsai without it but their technique in developing trees do change to accommodate their soil. I’m sure if akadama was 45 dollars a bag in Japan, nobody would use it as well. LOL. Thanks for the comment Sulaiman and take care! Fantastic article Peter! Many thanks for posting it. Lots of useful information and food for thought in it. Thanks Peter… this is a great post and I learned some very important information. We use lava rock here in Birmingham Alabama and for me its almost 70% of the mix. The other components are akadama 25% and sifted pine bark mulch. I think I may be watering my pines too often to get faster growth. After reading this I will let the pines dry out more. Thanks again for the excellent post. very good post. I learned WHY I like certain soil mixes. never understood how soil moisture content affects growth and the importance of allowing trees to dry out just enough. Wow, pretty intent. I use akadama and price but this well written article has opened my eyes to dome additional points. Although I take reporting seriously of course, this article may make me more aware of the effects of the soil composition. I use decomposed granite, forest humis, and peatmoss. This was from my first instructor Ben Suzuki and I used it for everything. Now I’ve become more refined and even more so after reading this article so thanks for taking the time out of your busy schedule to share this with us back in the states.